The Flicka series are 3 of the best horse stories! The first book is called "My Friend Flicka" and it tells the story of how Ken McLaughlin found Flicka and how their friendship grew. The second book is called "Thunderhead" and it's about Flicka's rebel white stallion son who causes all sorts of trouble and how Ken tries to make Thunderhead into a race horse. 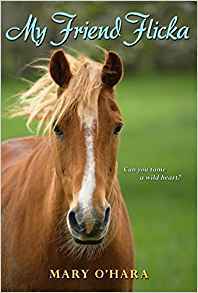 The third and final book is about Thunderhead and how he steals an expensive thoroughbred mare named Jewel and how her owner and Ken try to rescue Jewel. At the end of the series, Mr. McLaughlin retires his range stallion Banner and chooses Thunderhead to be his new range stallion. This is my all time fave book! I love it! If you haven't watched the movie I highly encourage it! The second book is great too! And the third! if you're a horse crazy girl this is a book for you. i think this is best for girls that are about 12 and up, and if you like this book there are two more books this lady wrote and the names are thunderhead and green grass of wyoming by mary o'hara. I didn't know it was a series! i have got ll the flicka movies but i hope to read all the flicka books in the public library. 1)My Friend Flicka: Ken McLaughin gets his horse Flicka. 2)Thunderhead: Thunderhead, Flicka's foal, kills the Albino. The albino is a wild mustang(featured in My Friend Flicka as well). He steals any and all mares; he is the outlaw horse. When Thunderhead kills him, he takes over the role of the stallion, the outlaw horse. 3)Green Grass of Wyoming: A girl in Philadelphia has been bought a thoroughbred filly, imported from England. Along the way, the horse car, which was put on an old, rotting flatbed, gets loose and rolls down the hill, and the rest of the train goes on without the filly. Thunderhead comes across the horse car, kicks it open and adds the filly to his band. He goes on stealing mares from people all over the territory. Ken still believes he can be tamed. However, none of the ranchers around agree. flika is a brown horse in the book. there's a movie about the same thing and i got them and there. awesome too! those books sound soo cool. i want to read them but i don't know where to get them?? The name of the third book is Green Grass of Wyoming. Whats the name of the third book? Anybody know? Anyway, I've watched the movies and they are fabulous! I love this book, its one of my fave to read. Anyone will fall in love with this story. I hope I can read the next 2 in the series!! I've seen the movies flicka and flicka 2 but have never read the books my mom is going to get them for me so can't wait but the movies are my all time fave like best horse movies out there! I recommend them to everyone who hasn't seen them! Though I think in the movies, flicka shouldn't be black I think too many movies have black horses that little girls fall in love with it's kinda racial to different-colored horses! There are more books? I thought My Friend Flicka was a single book series. Anyway, 'My Friend Flicka' is a beautiful book, sad, and very nice. I have two copies of it, in case one gets destroyed. My mum found her old series and I just can't stop reading them! They are such great books! I've read My Friend Flicka and Thunderhead, but I can't find the last one. I've also seen all of the movies. The only bad thing is that thunderhead is out of print, therefore I treasure my beat-up copy of it.